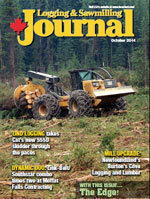 Most long time sawmillers have a story or two to tell about beehive burners. Some of them might even be true. Everyone’s who’s ever lived near a sawmill back in the day has their own memories of the sometimes cantankerous burners. All of them share evocative images of a beehive burner, incandescent red, showering sparks into a cold northern night. Beehive burners are a potent symbol of their time. But they’ve become victim to the forest industry’s maturation. An example of imaginative beehive burner restoration is near Malakwa in B.C.’s southern interior. After the nearby Beaumont mill closed in 1999, the burner was taken apart and reassembled, with a post and beam inside conversion. The Burner is now a licenced restaurant with its own distinct atmosphere. For decades, the conical-shaped wood waste burning sentinels of steel dominated the landscape around every size of sawmilling operation in British Columbia and beyond. Now most of them have vanished. The beehive burner has been elbowed into obscurity through a more progressive attitude toward utilizing the total wood resource. 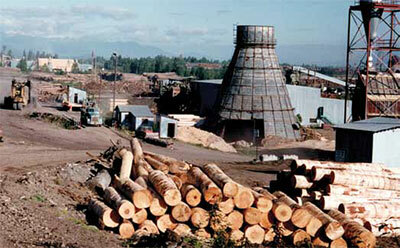 Today’s sawmillers strive to produce no residual “wastes” from the conversion of logs to lumber. Those “wastes” have become merchantable byproducts, removing the raison d’être for the beehive burner. The tell-tale coating of fly ash over everything downwind of a beehive burner is consigned to yesterday’s memories, much to the relief of folk with susceptible lungs. “It’s the social implications of beehive burners that first caught my imagination and then fascination,” recalls Trelle Morrow, self-published author of The Big Smoke, B.C.’s and probably Canada’s first—and only—book devoted to the beehive burner. Morrow adopted a thoughtful, measured approach to his subject. The result is a thorough examination of beehive burners since their introduction into central B.C. around 1922. Through the examination of the beehive burners’ social context, a fascinating glimpse emerges of the forest industry’s growth and development. The Big Smoke is liberally illustrated with colour and historical photographs and is a useful new reference for regional historians. Morrow, a long time Prince George resident, retired from a successful career as an architect about 15 years ago. Since then, he’s researched, written and published more than half a dozen books, although The Big Smoke is the only one directly connected with the forest industry. Morrow’s focus is on historical archaeology. “It’s concerned with our built environment, the nuts and bolts of our material culture,” he explains. 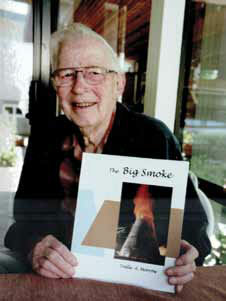 Trelle Morrow self-published author of The Big Smoke, B.C.’s and probably Canada’s first—and only—book devoted to the beehive burner. The Big Smoke is liberally illustrated with colour and historical photographs, and provides a fascinating look at the forest industry’s growth and development. Morrow did work in the forest industry as a teenager but both his grandfather (sawfiler) and father (planerman, small mill manager) had careers in the industry in the east Kootenay and north Okanagan regions of B.C. So there’s sawdust in the pedigree. Morrow’s research indicates the first large beehive burner was introduced to the Fort George Region in 1922. It was manufactured by Colby and installed at Giscome Sawmills, a few kilometres east of Prince George on the Grand Trunk Pacific rail line. Morrow says beehive burners averaged 50 to 60 feet in height but some towered up to 100 feet high and 100 feet at the base. At least one burner is still operational in the Fort George area, near Valemount. And there are others still functioning west of Prince George. In an ironic twist of fate, the beehive burner at Babine Forest Products near Burns Lake, like the mill’s planer, escaped the horrific explosion and fire of January, 2012 which killed two sawmill workers and injured 20 others. The 90 foot tall Lamb-Cargate burner, installed by Alvin Scarff Steel Erectors, was pressed into use as a storage facility for furnish to help feed the nearby Pinnacle Pellet plant. An example of imaginative beehive burner restoration is near Malakwa in B.C.’s southern interior. 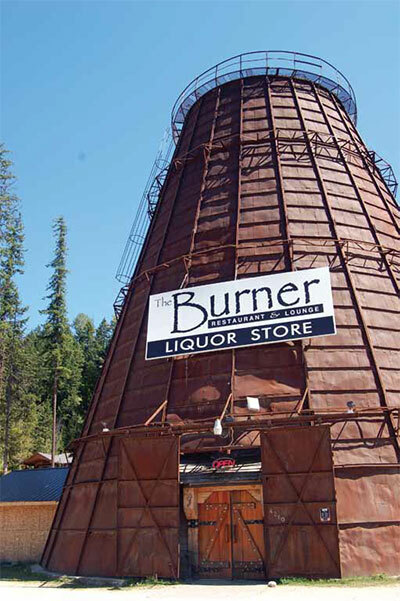 After the nearby Beaumont mill closed in 1999, the burner was taken apart and its 48 steel panels reassembled into a structure 70 foot tall and 70 wide at the base with a post and beam inside conversion. The Burner is now a licenced restaurant with its own distinct atmosphere. Provincial governments have been imposing regulations on mill operators to clean up their waste wood burning operations since the 1970s. “But the marketplace has been the main agent causing the demise of the burners,” believes Morrow. “The economy has changed and wood waste is now merchantable.” The most recent sliding date for the final phasing out of beehive burners is 2016. A few beehive burners are still operational in B.C. The burners had an average height of 50 to 60 feet, but some towered up to 100 feet high, and were 100 feet at the base. Morrow says the technology behind beehive burner operation significantly evolved from the earliest days of their use. In those early days, air for combustion was simply introduced at the burner’s base. But as burner operators strived toward a more complete combustion and to accommodate the different burning characteristics between wood species, additional air sources were used. These included adding cyclones high to the outside of the burners to deliver shavings or other materials into the chamber. The temperature inside the burners was critical to the success of the burn. “Depending on the variables, you needed about 700 to 900 degrees Fahrenheit to get good combustion. The burners were fitted with dampers— the early ones were manual, motorized later on—to control the temperature,” continued Morrow. discussion and later automation to improve burning conditions, he adds. Lamb-Cargate of New Westminster and Rees and Mainland Foundry & Fabricating in Vancouver were prominent manufacturers of beehive burners. Interior Mill Equipment of Grand Forks was one of the prominent manufacturers upcountry, said Morrow. In Prince George, Fraser Fabricating & Engineering and Ward Steel Erectors were prominent beehive burner developers. Today, many of the surviving derelict beehive burners are on private property. Sometimes they’re accompanied by nearby sawdust piles shrouded by bush and colonized by weeds. Elsewhere, the land owners use beehives for animal shelter or storage, noted Morrow. With others, local people feel proprietorial and protective of the beehives and want to see the structures preserved. They recognize their connection to a largely bygone era, says Morrow.